Dear Del: Please, stop the SPAM! Editor’s note: Kaspersky Lab, a Moscow-based IT security company, recently reported that the percentage of spam in total email traffic worldwide rose in the 2nd quarter of 2013 to 70.7%. You read that right – 7 out of 10 emails are spam! Kaspersky also noted, “Many emails with malicious attachments were addressed to corporate users.” If you’re not seeing them in your inbox, then your spam filters and blockers must be working pretty well. 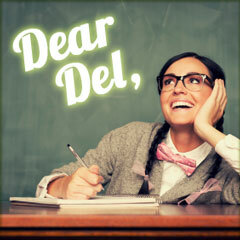 However, if you’re noticing an uptick in spam, we offer some tips below in our latest #deardel column. Why do I get so much spam and can I do anything to prevent it? Creating spam messages is incredibly easy and cheap. Spam is also very easy to distribute to millions of people. Anyone can start receiving spam if they are affected by one of the following spam triggers. There are companies that sell lists of email addresses (usually compiled onto inexpensive media, such as a compact disc). Email accounts can be hacked and have their distribution lists extracted. By inadvertently replying to a spam email or clicking on a malicious link in an email, you may be adding your email address to a spam distribution point. Email addresses can be extracted from news groups, chat rooms, or other legitimate mailing lists. Sometimes the large email hosting companies (MSN, Hotmail, Comcast, Gmail, AOL) will have their mail servers attacked by a technique called a “Dictionary Harvest Attack,” in which malicious software will be able to perform an extremely rapid search and determine real email addresses by guessing every possible letter-number combination. Once a spammer has your email address, you will typically receive large amounts of spam. So, how can you reduce the amount of spam you receive? Here are a few suggestions. Avoid subscriptions to mailing lists and steer clear of malicious emails. Do not reply to a suspicious message or click on any embedded links. Do not forward chain emails. DelCor’s NOC can address and reduce spam attacks by creating custom content filters in the spam filtering service, based on message content and message header content. Install an antivirus solution and keep it updated, as it will typically scan incoming emails for malicious content. As a last resort, your email address can be modified. Changing or creating a new email address will usually solve the spam problem – until the next spam trigger occurs. Unfortunately, the reality is that everyone is affected by spam and there is no guarantee that you will ever be spam-free. For more on DelCor’s services in this area, take a look at our network management capabilities.